From my midship perch on the sharply slanted deck of the 80-foot schooner Adirondack as it slices the swift crosscurrents of the Upper Bay of New York Harbor, gritty Manhattan is transformed into the shimmering silver city of our dreams. Only the view from the troposphere in a passing jet offers a comparable perspective. From sea level, as from on high, the anxious cacophony, the urgent currents of street and sidewalk traffic, the crowding, the bustle, the grind and the grime all evaporate, leaving a pristine, breezy urban paradise, its sharp vertical planes glinting in the late afternoon sun like a jewel in a sea green setting. I wasn’t, but you wouldn’t know it to watch me board the two-masted, cedar-and-birch beauty as it bobbed at a floating dock in a cove at Chelsea Piers. Although I live less than half a block from the shores of the Hudson River– if the sea wall at Battery Park City can be called a shore — I lack the sea legs of a seasoned sailor. Somehow the two crewmen stationed at the rail seemed to sense this when I stepped from dock to ship just as a swell rocked the boat. Swaying drunkenly, my knees bending as if on a Bongo Board, I might have pitched into the drink between the dropping platform and the rising port side of the hull if not for a helping hand from the crewmen, who were kind enough not to smirk. My fellow passengers included Richard Saez, a sailing enthusiast from Manhattan who said that he cruised the harbor aboard the Adirondack at least 20 times last year. “I love this; it’s in my blood.” The son of a son of a sailor, Mr. Saez claimed a long line of seafaring forebears, including his father, a merchant marine who worked on the great transoceanic passenger ships, and a grandfather from the Canary Islands, a seamen’s haven that legend holds “is all that’s left of the lost continent of Atlantis,” Mr. Saez said with a knowing wink. While we passive sailors chatted and didn’t lift a finger except to accept the free Champagne, wine, beer and soda offered by a steward, the crew members cast off lines and got busy organizing the rigging — a bewildering network of ropes and pulleys — and preparing to hoist the sails. Captain Freitas, meanwhile, executed the countless tricky moves required to unpark the schooner from the tight confines of its berth and, with a series of quick, low-power thrusts from a stern motor, maneuvered it out of the cove and into the river. With his deep tan, white Hemingway beard, calm manner and easygoing good humor, Captain Freitas is the vely picture of the weathered seafarer. Hailing from the old whaling town of New Bedford, Mass., the 53-year-old skipper runs a charter sailing service from his home port in St. John, Virgin Islands. As we motored slowly out of the cove, the captain gave us a quick history lesson, noting that Chelsea Piers had been built at the turn of the last century to serve ocean liners. From Pier 54, just south of the sports complex where golfers now swat tee shots into a web of black netting from a four-tiered driving range, the British liner Lusitania had steamed to its doom in 1915. It was sunk and 1,198 died when a German U-boat fired a torpedo into it. Nearby, he said, was the site of the Cunard berth where the unsinkable Titanic was supposed to tie up at the end of its history-making maiden voyage in 1912. Steering the Adirondack toward the Hudson’s far shore in Hoboken, N.J., about two-thirds of a mile away, Captain Freitas referred to the Hudson as the North River, just as Henry Hudson had done in his ship’s logs four centuries before. “Why the North River and not the West River?” I wondered, having always assumed that the East River was so named because it bordered the east side of Manhattan. The Hudson flows 300 miles from the Adirondacks and “isn’t really a river at all once it reaches Lower Manhattan,” he said, further eroding my fanciful notion that living near the river made me something of a nautical expert. Whatever it’s called, we crossed the body of water between Manhattan and New Jersey. Once we came a few hundred yards within the shoreline below Stevens Institute of Technology in Hoboken, a passenger pointed out River Street, the road where Charley, Rod Steiger’s character in “On the Waterfront,” met his doom. Then Captain Freitas turned the schooner’s distinctive blunt bow south. Raising first the mainsail, then the foresail and the two headsails, the captain and the crew members had us speeding south before a strong wind that a fellow passenger, Noah Barnes, the Adirondack’s 29-year-old weekend skipper, estimated at 15 knots, or 17 miles an hour. Captain Barnes was along for the ride with his girlfriend. Sailing past the Pavonia and Newport ferry stops on the Jersey City waterfront, where new steel-and-glass residential and office towers are rising to create a boxy, gap-toothed answer to the Manhattan skyline, we were carried by wind and currents back across the river until we were gliding past Battery Park City in Lower Manhattan. Before sailing with Captain Freitas, I had heard from one of my Battery Park City neighbors about his actions on Sept. 11, when he sped south from the Piers aboard the Chelsea Screamer, a 1,600-horsepower excursion boat that he captains on weekends. At the North Cove marina, west of the collapsed towers, he helped organize volunteer boaters who carried Out the makeshift evacuation of thousands of panicked office workers and residents stranded on the esplanade in the blinding cloud of smoke, ash and pulverized dust that had once been the Twins, as neighborhood children liked to call the World Trade Center towers. Captain Freitas made trip after trip that day, ferrying 50 and 60 people at a time from the esplanade to Liberty State Park in New Jersey, directly across the river, and to and from the Chelsea Piers, where thousands more people fleeing Lower Manhattan took refuge in the hours after the collapse. “He was really one of the unsung heroes that day,” my neighbor, Capt. Scott Shields, a city Parks and Recreation Department marine rescue specialist, had said of Captain Freitas. From the river at the southwest corner of North Cove, you used to be able to look down Liberty Street and see the geometric patch of blue that separated the two silver pillars one block to the east. Now there is nothing but sky to be seen, and as we sailed past the emptiness and out into the Upper Bay, the Adirondack’s captain didn’t say a word. Traversing the vast Upper Bay, we watched the city recede aft as we sped past buoys that mark the shipping lane that oceangoing cruise ships and freighters follow from the Lower Bay’s deep-water Ambrose Channel through the Narrows to their berths on the Hudson. With sails scooping at the stiff wind and our deck at a steep 45-degree angle, we followed an exhilarating, sweeping tack that carried us across the harbor and north again. As we sped close by Bedloe’s Island and the undulating skirts of the Statue of Liberty, it occurred to me that we were being pushed by the same North Atlantic winds and buffeted by the same fierce tidal currents that Giovanni da Verrazano encountered in the spring of 1524, when he entered the harbor seeking a route to Asia. The waters are the same as they were then, but where we watched the sun reflecting off the silver-and-glass towers of the financial district from the deck of our schooner a mile or two out in the harbor, 17th-century colonists arriving by ship at the Dutch West India Company’s New Amsterdam settlement in New Netherland expected to behold a paradise. They had heard of unicorns gamboling under palm trees and natives who behaved like lambs. From their decks, the colonists saw a tiny settlement on the southern tip of what is now called Manhattan that consisted of a few windmills and low buildings in the protective shadows of a military fort. The settlement was home to a succession of autocratic director generals (Peter Stuyvesant being the most famous) who ran it like a feudal manor and abused the same American Indians whom Hudson had found so friendly and well dressed. In 1643 a premeditated act of terror occurred in New Amsterdam and across the river at the Pavonia settlement when on successive nights Dutch soldiers attacked two peaceful riverfront Indian villages, murdering and mutilating scores of innocents. Twelve years later, Indians led an attack to avenge the death of an Indian woman shot by a Dutch landowner for picking a peach without permission in his orchard on Dey Street, a road that then traversed the site of the future World Trade Center. The day after the shooting, an armada of 70 canoes sailed from Pavonia to New Amsterdam, where rampaging Indians killed the landowner and burned the village before moving on and destroying a struggling Dutch settlement on Staten Island. A different sort of terror stalked the waterfronts of New York Harbor in later years, when, according to Herbert Asbuiy’s book “The Gangs of New York,” troops of river pirates in rowboats preyed on the ships and businesses that flourished on the Hudson River piers in the 19th centuty. In 1869 the Charlton Street Gang, led by a vicious woman named Sadie the Goat, flew the Jolly Roger from the mast of a hijacked sloop and terrorized the waterfront. When one Manhattan pirate, Albert E. Hicks, was hanged for murder, as many as 10,000 people floated off Bedloe’s Island to watch. A gallows had been erected where Lady Liberty now stands. Peace reigned in Lower Manhattan on the day the Adirondack made its first sail of the season. By the time we returned to Chelsea Piers, the wind and water surface had calmed considerably. As we coasted toward the cove at Pier 62, a fleet of nine small sloops glided past like a group of belles at an antebellum ball. On shore, to the north and east, the rays of the lowering sun played on the crown of the Empire State Building. As soon as we entered the cove, the familiar noises of the city, though not the city’s tensions, returned with the bleat of a car horn and a static blast from a public-address speaker at the adjacent skateboard park. The sounds reminded us of how soothing it was to spend two hours listening to nothing but the rush of the wind and the slap of the waves on the Adirondack’s resonant hull. It is a music I won’t soon get out of my head. THE ADIRONDACK. Designed by Scarano Boat Building Inc. of Albany, the Adirondack docks at Pier 62 in the northernmost cove at Chelsea Piers, at West 23rd Street and the Hudson River. It was modeled after the pilot boats that carried 19th-century ship captains and harbor pilots to oceangoing vessels anchored offshore. “They were built to go out in nasty weather to meet the clipper ships,” said Capt. Noah Barnes, the Adirondack’s weekend skipper. “They had to get the pilot to his ship as fast as possible.” The schooner offers two-hour sails daily at 1:30 and 3:30 p.m., for $30 on weekdays and $35 on weekends. Also daily are two-hour cruises at 6 and 9 p.m., with free Champagne on the later trip. Those sails are $40 on weekdays and $45 on weekends. Children 16 and under are $25 on all trips. Reservations are recommended: (800) 701-7245, (917) 447-7245 or (646) 336-5270. Information: www.sail-nyc.com. THE PIONEER. This steel-hull schooner was built in 1885 and sails from Pier 16 in the East River at the South Street Seaport, at the foot of Fulton Street, in Lower Manhattan. “She’s an example of a coastal schooner,” Captain Barnes said, “the 19th-century cargo ships that were the 18-wheelers of their day; a real workhorse.” Run by the South Street Seaport Museum, the Pioneer offers sails six days a week through mid-September: Tuesdays and Wednesdays, 7 p.m.; Thursdays and Fridays, 7 and 9:30 p.m.; Saturdays, 1, 4, 7 and 9:30 p.m.; Sundays, 1, 4 and 7 p.m. Trips that set sail at 7 p.m. and earlier are $25 for adults, $20 for students and 65+, $15 for children 12 and under. The 9:30 p.m. trip (also on some holidays) is $20 for adults, $15 for students and 65+, $12 for children 12 and under. Reservations recommended: (212) 748-8786. Information: www.southsreetseaport.com. SHEARWATER. This 82-foot-long 1929 schooner docks at the North Cove marina in Battery Park City at the World Financial Center. Built in Maine, the Shearwater has circumnavigated the globe twice and during World War II served on submarine patrol for the United States Coast Guard. With teak decks and brass fittings, it is “a beauty,” Captain Barnes said. Beginning on Monday, the Shearwater will offer daily sails: Mondays through Fridays at noon (one-hour trips), $18. Mondays through Thursdays at 5 p.m., $30; 7:30 p.m., $35. Fridays at 5 p.m., $35; at 7:30 p.m., $40. Saturdays at 3 and 5:30 p.m., $35; 8 p.m., $40. Sundays at 1, 5:30 and 8 p.m., $35. Reservations required: (800) 544-1224. Information: www.manhattanbysail.com. THE VENTURA. This 72-foot-long sloop built in 1921 has a mahogany-plank hull, Indian teak decks and a spruce mast. Like the Shearwater, the Ventura docks at the North Cove marina at the World Financial Center in Battery Park City. It offers a two-and-a-half-hour sunset harbor cruise on Fridays at 6 p.m. ($35) and a take-your-own Sunday brunch cruise at 11:30 a.m. ($35). 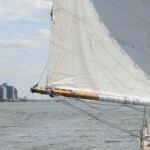 Information: www.sail-nyc.com. Reservations: (212) 786-1204. BOOKS AND CHARTS. Books and sea charts related to New York Harbor and the Hudson River are available at New York Nautical, 140 West Broadway, at Thomas Street, in TriBeCa. Open Mondays through Fridays, 9 a.m. to 5 p.m. Information: (212) 962-4522; www.newyorknautical.com.